Closed Loop Hiring™ is the powerful process of connecting hiring data with post-hire outcomes. This allows companies to know, in real time, what’s working and not working in their hiring process. This gives companies the insights needed to dramatically improve their hiring process and thereby, new hire success rates: performance, retention, and cultural fit. Journeyfront’s ‘first of its kind’ software platform makes Closed Loop Hiring™ possible. Our innovative suite of tools make it easy to capture and organize your hiring data so you know exactly what’s working and not working at any given time. Detect hard to measure traits using our standard assessments or customize your own. Roll out a structured interview process that’s standardized, scalable, and robust. Automate the initial screen with our auto-scoring applicant screening questions. Consolidate all hiring data in one place, using easy to understand scorecards. 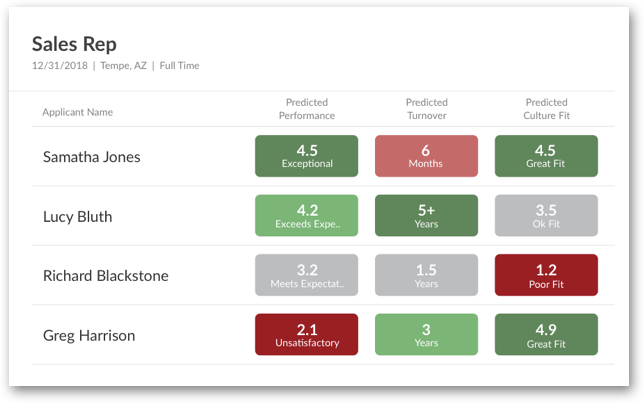 Journeyfront also offers an artificial intelligence (AI) add-on that will identify patterns in your historical data to predict applicant performance, retention, and cultural fit. To date, these predictions, have had an accuracy rate of 73-91%. With closed loop hiring, your hiring and performance management systems can now talk to each other. 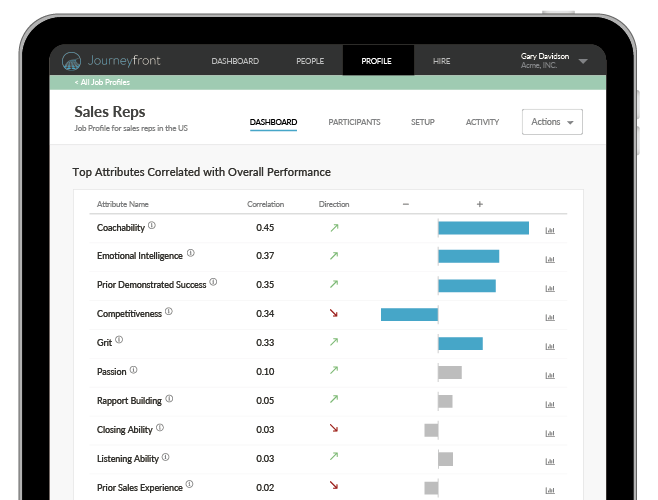 Journeyfront dashboards reveal what's working and not working in your hiring process in real time, all driven by your own data. "Organizations that don’t check to see how well their practices predict the quality of their hires are lacking in one of the most consequential aspects of modern business."